Game description: Haven: Call of the King blends multiple gameplay mechanics into a free-roaming universe. 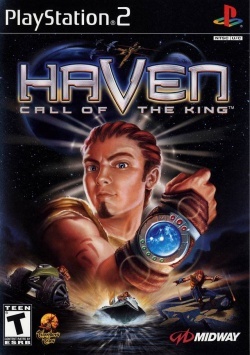 Played out through an epic tale of a hero who seeks to liberate his people from the tyranny of enslavement, Haven: Call of the King provides total freedom to move anywhere on foot or in vehicle. Through intricate and fantastic worlds, you'll transition between turret-based shooting, boat racing, bike battles, plane flight, gladiator-arena combat, and space exploration. This page was last edited on 26 December 2016, at 17:29.